Have a suggestion for the Grim Fandango Network? Spotted a mistake? Want to submit some fan work? Excellent. Then you’ll want to speak to Ryan Williams, who can be reached by sending an email to this masterfully encrypted address: grimfandango <at> ryanjohnwilliams <dot> com. The site also has pages on Facebook and Twitter. 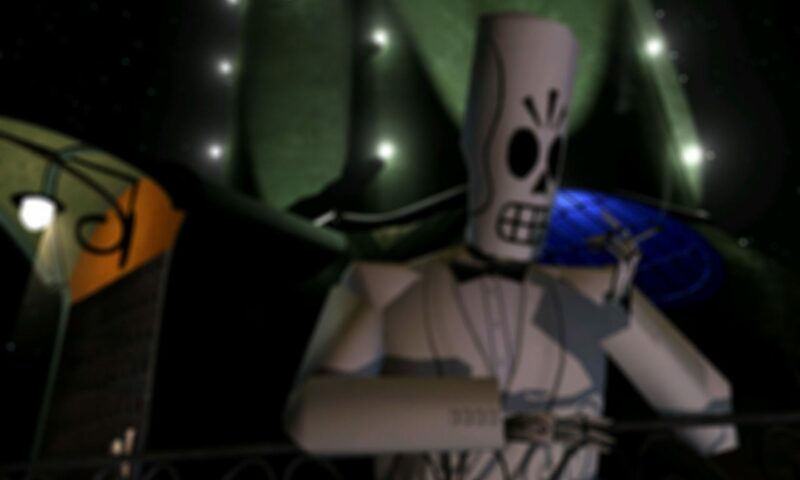 Hi, I’m a huge fan of the game and have recently written a play version of the Grim Fandango story. I want to perform it with friends at my school but I’m wondering about legal issues given that it’s not my original story and I’m not sure how to acquire rights for it. I’ve reached out to Double Fine productions with little success, and it seems pointless going down the LucasArts route. Any advice would be greatly appreciated from anyone who knows anything about this sort of stuff. I can’t speak with authority, but honestly for a school play I can’t see being an issue. If it were a widely publicised commercial film or something else involving money I could see you being sent a cease and desist order — but very unlikely you’d be sued unless you were making a bunch of money from it and they could claim damages. LucasArts and Double Fine have both historically been pretty tolerant of fan art, fiction, etc and seemingly seen it as the positive thing that it is. I’d imagine Disney is quite similar considering the popularity of its franchises. Just be wary of trademarks (which companies are obliged to defend) and profiting.